Nearly 300 guests joined us on 9th May 2016 for a packed agenda of talks, presentations and discussion at the IET, Savoy Place, London. Connections were made, relationships forged and ideas shared. The afternoon began with our Chief Executive, Philip New and the Chief Executive of the IET, Nigel Fine, signing an agreement to work more closely together in the future, following on from the success of our joint work on the Future Power Systems Architecture project, on behalf of DECC. Nick Smailes, our Head of Business Development, then led a panel debate focusing on Whole Energy System Thinking. Our panellists all argued for different needs related to a whole energy system. With almost a third of the votes, Prof Janette Webb’s argument on ‘the need for further whole system research and modelling in heat’ won the approval of the delegates. There were multiple suggestions for other topics, research questions and areas that we should consider including, financial / investment models, ensuring customer / consumer engagement, using demonstrators to de-risk investment and ensuring that future systems are capable of adaption / evolution – all of which will be part of our thinking going forward. The next session, delivered by Paul Jordan, our Head of Strategy Development and Business Planning, focused on our new five-year delivery plan. Then Eric Brown (Interim Head of Strategy and Innovation) and Dr Simon Harrison, Chair of the FPSA Project Delivery Board gave an update on the conclusions of the Future Power Systems Architecture project. Grant Bourhill (Director, Smart Systems and Heat) wrapped up the afternoon with a short presentation on the Smart Systems and Heat programme that we are successfully delivering on behalf of the Energy Technologies Institute (ETI). After a short break, Energy Systems Catapult Chairman Nick Winser gave a brief welcome to the keynote speakers. Our first speaker was Professor Sir David King, Special Representative for Climate Change. 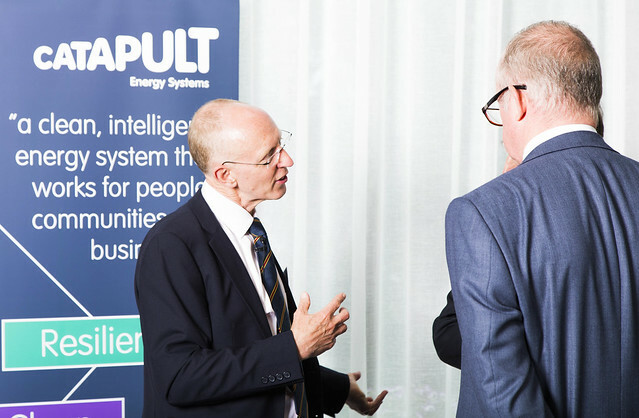 Sir David spoke of how energy transformation is the biggest opportunity since the industrial revolution. Matthew Bell, the Chief Executive of the Committee on Climate Change then followed, setting out a number of issues that needed addressing, such as ‘how do we reduce the cost of carbon capture?’, ‘how and where are we going to use hydrogen?’ and ‘what’s going to happen on the demand side?’. Catapult CEO Philip New then closed out the evening by looking back on a thought-provoking day. He underlined that although the challenge ahead may be considerable, with the energy and commitment he has seen, it is one that is entirely possible.